In Barbara Rink's installations, drawings and paintings go abstraction and imagination hand in hand. Her installations are paintings and drawing transformed into three dimensions. Rink's recent work shows an intimate universe that is achieved through re-shaping, cutting, folding and collapsing. 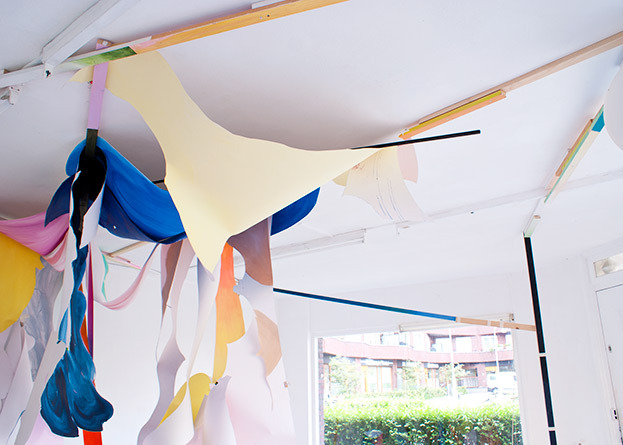 At Project Space Zoete-Broodjes, Barbara Rink creates an open architectural structure, a shelter, as a metaphor for the barrier between culture and nature, painting and sculpture. Barbara Rink Barbara Rink lives and works in Amsterdam. Education koninklijke academie van beeldende kunsten in Den Haag Artist-in-residence URRA Residencies in Argentinie | Santa Fe Art Institute | Vermont Studio Center. Exhibitions Bradwolff Projects | De Punt | Bookstore Space | Soledad Senlle Art Foundation. Project Space Zoete-Broodjesis a platform for contemporary art that provides solo presentations of artists with an experimental approach to the space. In the series My Fiends the artist is given the opportunity to work two weeks prior to the exhibition.